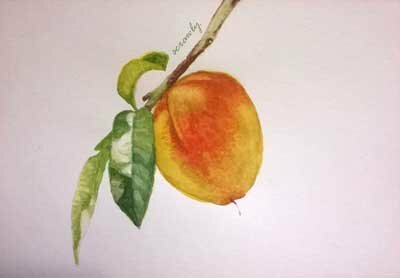 Another study piece, today is a peach drawing. 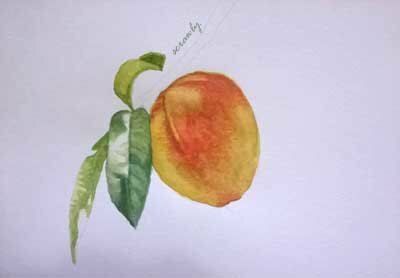 I chose peach because a long time ago, @Shibasaki made a wonderful tutorial about drawing a peach. 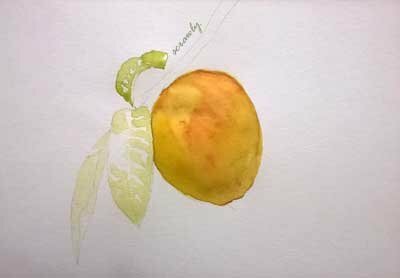 As he is a great painter and teacher, it is a delight for me to follow along his lesson. The photo reference is provided by EllenChan and sourced from the free image website pixabay. As for the step by step, I tried to follow my great teacher @Shibasaki, but I actually failed and had to redraw this one. Anyway, failure is part of the journey, isn’t it. 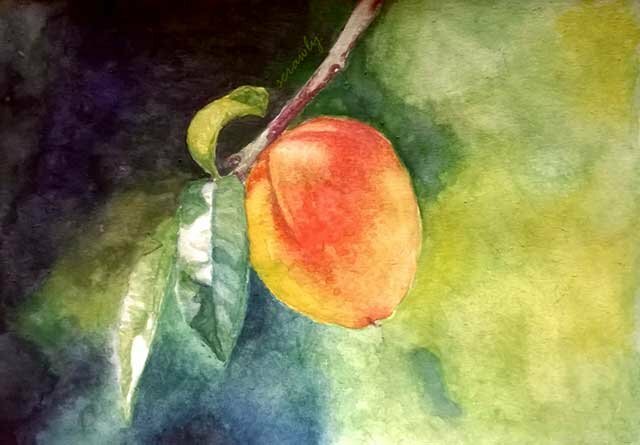 I moved back and forth from the peach to the leaves and branch because I need to wait for those parts to dry. It feels quite weird for me since if I draw this in digital, I would have finished each part before I move on to others. Also with Photoshop, the background would be quite easy to do, but with watercolours, it’s a new challenge for me to tackle. And I use a lot of the paints to do it too, I feel kinda bad and wasteful. On the other hand, it gives me something important to consider about life and stuff, so I’m okay with it. By the way, I have great friends on Steemit and they told me that they’re not bored looking at my watercolour practices so that’s a great relief for me. Whohoo! I love you all <3. Also I love Friday night ^_^. I admire your persistence and dedication. Doesn't work? No problem, I do it again :) Others would get frustrated and angry but you simply just do it again. Thank you for sharing and have a great weekend scrawls! I'm just stubborn that way hahaha. And also it feels like a game, once I made a mistake, I know not to do it that way so there's also curiosity involved in doing it differently. Thank you delish, I am glad the background is appreciated. The first time I put colours into the background, I regretted it but I'm glad the finished version is not something bad. Have a great weekend :D.
Ahhh thank you so much longer :D.
Aaaahhh there are things that I wish I could have done better in this one, but it is what it is and it's always lovely to know that you like my artworks :D.
I feel I am learning some blending in watercolour, but usually the next time I paint, I don't feel like I have learnt anything at all hahaha. 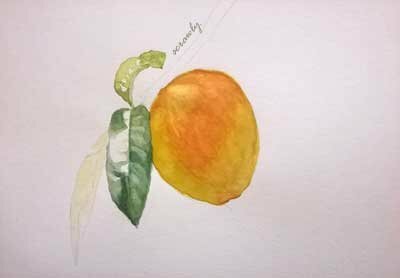 I heard that most beginner artists are interested in watercolours, even though it's a hard tool to master. I can understand why, watercolour art looks so beautiful and free. 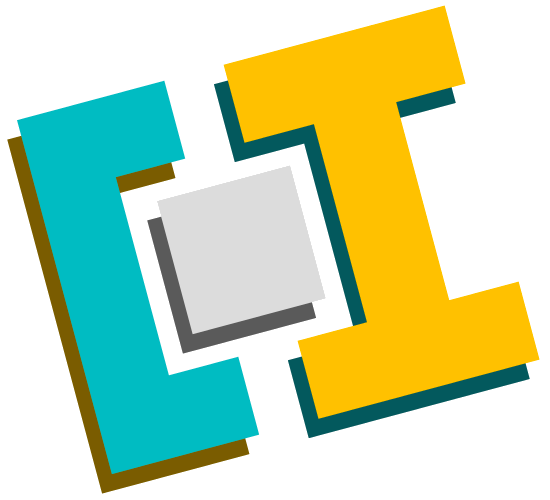 It is appealing, isn't it? And some people make it look so easy, so people like me get sucked in to try it hahaha. I'm glad you like my study :). Ahhh I'm glad you like the strong darkness of the background. I was unsure whether I messed up the background or not before. Hmm it's really hard for me to accept this occupational hazard, but you're right. It shouldn't deter me to make mistakes, because no way I can create art without failures from time to time. Even my digital art, there are lots of unfinished stuff, in a way they're not success either since they haven't made it. Thanks fyn, have a great Friday and weekend of course :D.
So well done @scrawly you are really coming along. I'll say the same thing I said on @veryspider strawberry and that is I like the white of the page and the colour intensity of your shadow. These were things my instructors were always on about at uni so I always look for them in studies. I understand why you and your art instructor appreciate the light and shadow of watercolours, because it's hard for me to leave parts of the picture unpainted, so I reckon it must be a skill that artists develop to know when to paint and to leave alone. I'm so happy when people mentioned good stuff about the background since I thought I messed it up when I painted the background. One of my friends told me that it looked better without it. 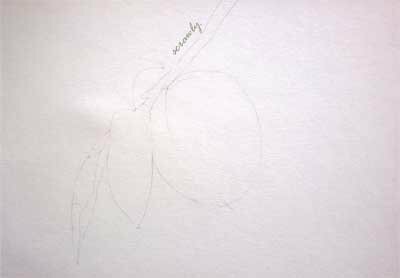 excellent I like this publication very much, I in a past publication elaborate some peaches, but your drawing is very good. I am going to follow @Shibasaki to learn about watercolor. I'm glad that I made you interested in Shibasaki's lesson, his lessons are really fun to do :D.
Your peach is great as well :). Your UA account score is currently 4.548 which ranks you at #1923 across all Steem accounts. Your rank has improved 8 places in the last three days (old rank 1931). In our last Algorithmic Curation Round, consisting of 211 contributions, your post is ranked at #22.
be careful with the water since one of leaves almost got merged with the background; though those those problems usually happens, i had to deal with that a lot before xd. Oh yeah, I know what you mean about the accidental colour blending. You know painting in watercolour sometimes feels like it's similar to gambling to me. If I play or push it too much, then I will lose big time, but if I don't brave it enough, then I won't win either. Looks like a very juicy peach 🍑! :) Love the background colors too, and how they blend perfectly. 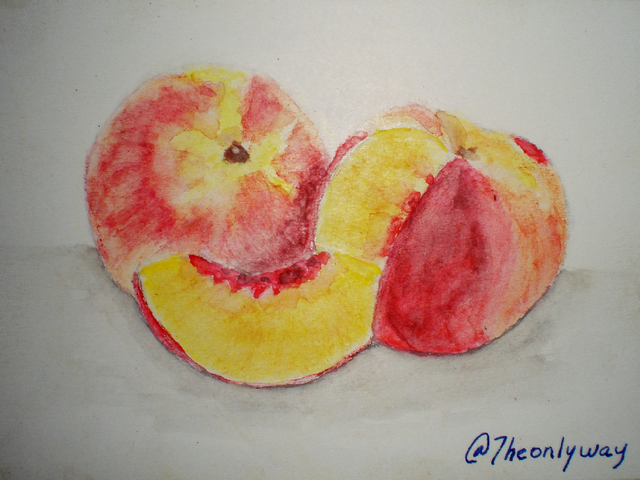 I just started following @shibasaki and found he’s a master in teaching watercolor painting. His videos are enjoyable and inspiring. I'm glad you like this peach. I love looking at ripe fruits myself, they're just so juicy and inviting my appetite :D~. Shibasaki is indeed a great art master, and on top of that he is also a very kind person. I have to say that is such a very pleasant surprise to me, most talented people are usually too busy to be nice XD. More control to the skill set. Cool. You do these studies how often? I draw everyday, as for the studies, I just do them when I feel like it :D.
Thank you beautiful ball of colours. If it turns, then isn't it going to be delicious? Hmmm!! I like vibrant colors! Amazing work! Thank you blissfish and wokeprincess :D.
Thank you himalayanwomb, you have an interesting nick :D.